• If the key is in contact with a metallic object. • If the key is in close proximity to or touching a key to the security system (key with a built-in transponder chip) of another vehicle. 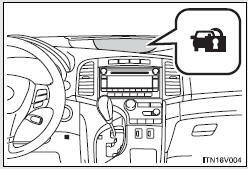 • For vehicles sold in the U.S.A.
• For vehicles sold in Canada Operation is subject to the following two conditions: (1) this device may not cause interference, and (2) this device must accept any interference, including interference that may cause undesired operation of the device.